With healthy salads in popularity now, Maki San with its design your own Japanese-inspiring salad or sushi roll is very appealing. This outlet at The Cathay Handy Road must be the first of its kind in Singapore, and I was excited to know I am put almost anything I want in my rice rolls. You can customize salads and sushi, with over 80 ingredients to choose from, including a twist with some of the localized dressing. Char siew, Japanese curry, Thai chilli sauce? The extra specials ($2.50 per potion) some of my favourite fillings such as teriyaki chicken, smoked duck, grilled unagi, tempura prawn and roast beef. The price is pretty affordable as well, $6.90 for a ‘Little San’ and $9.90 ‘Mega San’. So students from the nearby SOTA, Lasalle and NAFA can venture over for a treat without feeling overly broke. My sushi essential was a combination of shredded chicken, Japanese omelette and avocado, wrapped with healthy brown rice including a very special char siew sauce. Instead of the usual seaweed, mine was covered in soy with sesame wrap. Honestly, I was not expecting much as a shop like Maki San felt rather gimmicky, but was so wrong. The sushi was actually satisfyingly delicious with all the ingredients mixed in, and healthy tasting too. My guess is how good the sushi would taste would also depend on what you pick. 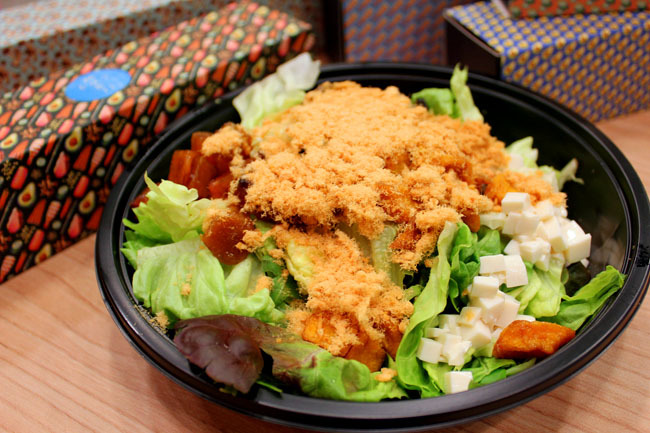 My choice of salad was Mixed Veggies with roasted mushrooms, silken tofu, roasted pumpkin, topped with chicken floss and dressed with yuzu sesame. Another plus point is the portions are quite generous for its price of $7.90. 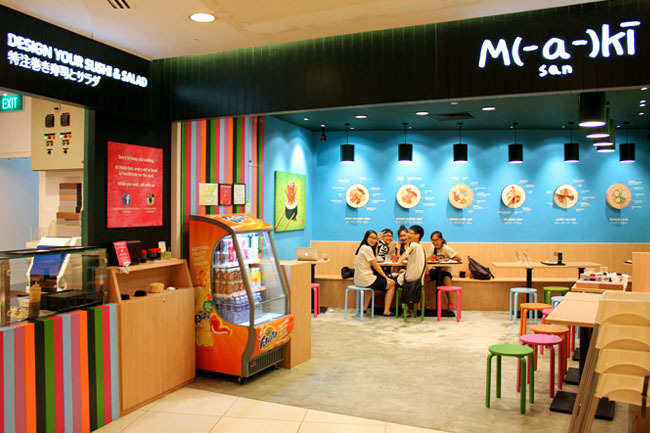 While Maki San’s location at The Cathay is not the best, I am a convert and was impressed with the execution of the whole concept – creative and inspiring with all the cute Japanese drawings. Now, wondering what I would include in a “Daniel-san” sushi that would best represent myself. 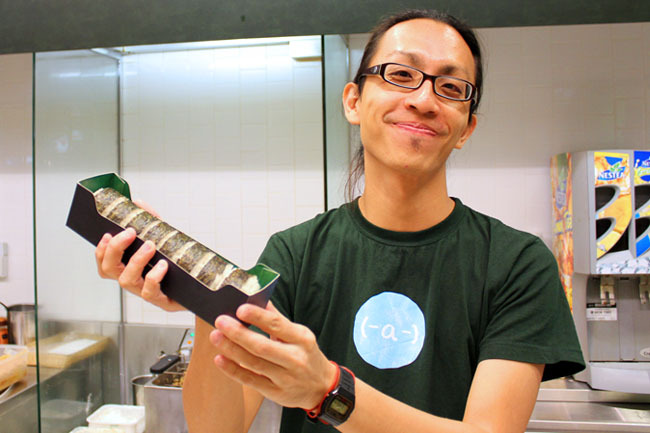 Christmas Giveaway – Maki San vouchers! Maki San will be giving 5 pairs of Maki-Lucki Vouchers for Daniel’s Food Diary readers to redeem two “Little San Sushi”. 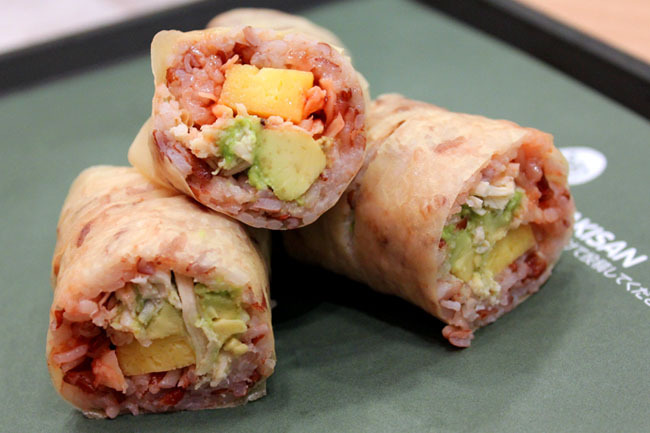 Step 3: Leave a comment below to name the ingredients you would include in a “Daniel San” sushi. All in the name of fun! Results will be announced Thurs 6 Dec 2012. Contest winners must have local Singapore addressses. my ingredients – roast beef, wasabi, brown rice & lots of vegetables. my ingredients – roast beef, wasabi, brown rice & lots of vegetables! Japanese omelette, seaweed, roast beef, Japanese curry and brown rice! Fiona san, yes, Japanese curry please. How about with fried tori? Tempura prawn, char siew sauce, jap omelette, rice and vegetables. Congrats! You have won a pair of Maki-Lucki Vouchers to redeem two “Little San Sushi”. To redeem, please email to DanielFoodDiary@gmail.com with your name and address. Arigatoo and Merry Christmas in advance! My ingredients for “Daniel San” sushi would be Avocado, Japanese omelette, roast beef, tempura prawn and brown rice with seaweed wrap. I choose the traditional seaweed wrap as there is no vegetable in it. It should taste good with the char siew sauce. Jasmine san, so much liao! Charsiew, chicken floss and yuzu sesame dressing! Quite an oriental tasting sushi Kamen-san! Ashley san, you can add more ingredients! June-san, I like the idea of soft shell crab with wasabi mayo. I agree lor! At first I thought it’s gimmicky too but in actual fact, the sushi is yummy. Yes, Rubbish san, bring me go eat next time. All that went into Daniel San sushi were Shredded Chicken, Japanese omelette & Avocado, wrapped with Healthy Brown rice that includes a special Char Siew sauce. Last but not least, covered in Soy in Sesame wrap *yumsYums! Hi Daniel! Liked and shared your facebook post! I ‘ve visited Maki-san twice and this is my favourite MEGA-SAN combo!! Quite value for $9.90 Hope the other readers could try my creation! Oh my Tommy-san, I can see you are really a big fan of Maki-san!! I LOVE SUSHI and ANYTHING ABOUT HANDMADE.. 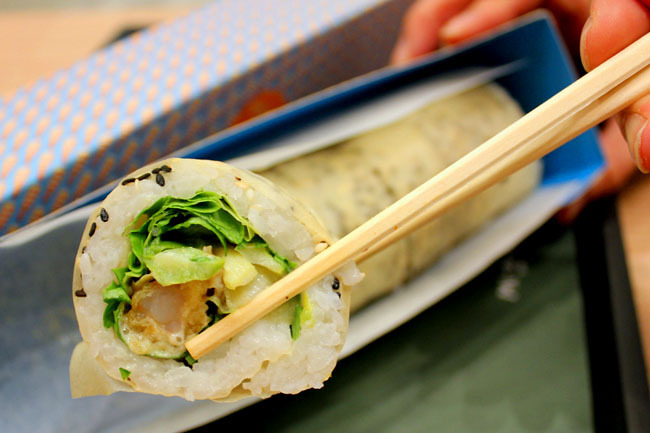 But unfortunately i never know there is a handmade sushi store and by request sushi roll in singapore.. I really wish to try it! Shrimp, Squid, Red Peppers, Chilli flakes, Ginger, Thyme, Garlic, Olive Oil, And Ground peppercorns. The Daniel San Seafood special~! softshell crab with chicken/pork floss and mayo! I love to include lobster, scrambled egg, romaine lettuce and wasabi. My version of a Daniel san sushi would be with brown rice, Japanese omelette,tempura prawn, Chicken floss, with spicy mayo. and soy with sesame wrap. My ingredients will be bakkwa, lettuce, baby tomato, barbeque sauce. I would like to have veggie ingredients like Asparagus, Tomato, Carrot, Chives, Rice and Seaweed. all time favourite Mayonnaise with egg, floss, crabstick, fried stuffs… practically any food! , German bratwurst with chilli and mustard! Never tot of that…. could work right? I love bratwursts! You got me hungry too! That will be quail eggs, cucumber, mayonnaise and smoked salmon! Cucumber, herbal tea leaves, roasted pork, cranberries! Cucumber, herbal tea leaves, roasted pork, cranberries!!! Soft Shell Crab, Japanese Cucumber with Wasabi Mayo. Tuna, salmon sashimi, crabstick and wasabi mayo. 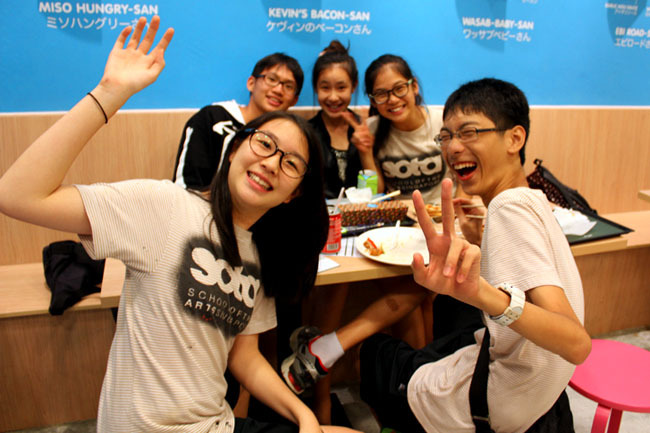 Congrats to Charmane Yeo, Tommy Leung, Tan Yi Ying, Jun Liang, and Rosemarry Sim Yee! You have won a pair of Maki-Lucki Vouchers to redeem two “Little San Sushi”. To redeem, please email to DanielFoodDiary@gmail.com with your name and address. Arigatoo and Merry Christmas in advance! Hi daniel. You have yet to reply me. I mailed the vouchers You should get it soon.